I hadn’t heard from the guys from Bad Elephant Music for a while so I was beginning to wonder what they were up to, whether there were any new releases in the near future. I always look forward to hearing the music they send my way; even if it might not always be to my taste it is always, without fail, interesting and worthwhile if nothing else. Therefore when Martin Hutchinson dropped me a Facebook message asking whether I fancied a listen to the new album being released by them on the 12th of April from The Far Meadow, I jumped at the chance. 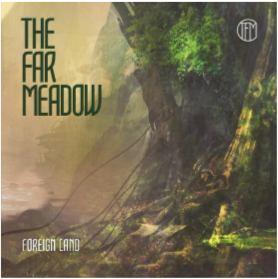 The Far Meadow are a progressive rock quintet based in London for whom Foreign Land, is their third release. Foreign Land is, however, for me my first exposure to the band, but as ever I’ve come at the experience with an open mind which has on the whole been well rewarded with this 5 track release. Well, when I say a 5 track album, with the epic opening track Travelogue, it is essentially two sides of four tracks each, with that opening song being a suite of connected pieces that truly does take the listener on a journey through a variety of styles and influences. The first thing to strike me was the excellence of the production. There has obviously been spent plenty of time on getting the sound just right; drummer, Paul Bringloe, admits that the album ‘hasn’t been the easiest to make,’ but that the band ‘very happy with the result.’ So they should be, from the very start with the Pink Floydian vibe of the introduction to Travelogue, through the gothic cathedral like majesty of Mud to the wonderfully atmospheric title track that completes the listing The Far Meadow have filled an album full of just the right levels of influence, inspiration and creative individuality. Often when a band also has it’s hand, collectively, on the production tiller, along with mixer Joe Gibb and David Elliot on mastering duties, a feel of production by committee takes over. Add to this the obvious talents of all the players (vocalist Marguerita Alexandrou, Keith Buckman on bass, guitars from Denis Warren and the keyboards of Eliot Minn joining drummer Bringloe) there can be a temptation to give full reign to each individual’s ability, often at the detriment to the songs flow. Give credit to this band, though, as they resist that temptation pretty much with a couple of small exceptions; there is a keyboard solo in Mud that does jar the flow slightly for this reviewer, but it is a very small quibble if I’m being totally honest. The various solos are both exceptionally good, with some of Buckman’s bass work being a superb highlight, and fit the songs brilliantly. They are complimentary to the other players, not competitive. I will own up to a certain trepidation in relation to Alexandrou’s vocals, mainly based on my first listen. Marguerita does sing with a certain sharp childlike quality that I thought may grate on multiple listens. However, these concerns have faded, not increased, as I’ve listened more and more to this album. I get influences of Kate Bush perhaps mixed with a sound of Rush that actually have grown on me as I’ve also grown to enjoy this piece of work. All in all The Far Meadow, with Foreign Land, have put together a fine work that has both intrigued and interested me and certainly has me looking further back into their work with this band and other projects these musicians have worked on. It is a rewarding album with plenty to find out with each listen. Beautiful playing of atmospheric songs that will be equally at home playing through headphones or in a live situation, Foreign Land is an album that will be a staple go to for aficionados of progressive rock music.